1. Remove all crust from the white bread and cut into small cubes and soak in the milk. 2. Set aside. In a sauté pan heat 1 oz. of olive oil and sauté gently and slowly garlic and onions, season with salt and pepper, set aside. 3. When onions are cool squeeze out excess liquid. 4. In a large bowl combine all ingredients except bread and milk mixture and olive oil. 5. Squeeze out milk from bread, discard milk, Add bread to all ingredients and gently fold and mix together. 6. Refrigerate meatball mix for one hour. 7. Line a sheet pan with cling film. Form meatball mix into 3 oz. balls this recipe will yield 20 x 3 oz. meatballs. Place on sheet pan as you go. 8. Refrigerate until ready to cook to keep their round shape. 9. In a large sauté pan place the 8 oz. of extra-virgin olive oil and heat. 10. When oil is hot place meatballs in pan, side to side allow enough space so you can turn them easily and gently. 11. When all meatballs are evenly browned off, remove from pan and set aside. 12. 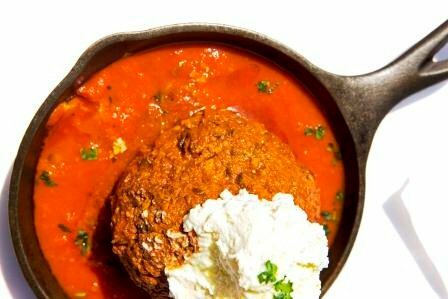 In a large clean pot arrange meatballs and cover with your favorite marinara sauce and one cup of cold water. 13. Slowly bring up to a boil and then allow to simmer covered for about 1 hour. 15. Meatballs should be removed from pot. Cook the sauce to the consistency you enjoy. 16. Serve over your favorite pasta and top with a dollop of ricotta and Extra Virgin olive oil.